Almo Nature Sterilised Salmon and Rice is a delicious, dry food that has been developed to meet the needs of sterilised adult cats. This dry food contains a reduced fat content, which helps your cat to maintain a healthy weight after sterilisation, and also salmon, a high-quality source of protein that is rich in omega-3 and 6 fatty acids and is easy for your cat to digest. Prebiotics like fructooligosaccharides and mannan-oligosaccharides naturally promote the spread of friendly bacteria in the gut, while yucca schidigera can help to reduce wind and stool odour. After sterilisation, it is very common for cats to eat more than they need; this can quickly lead to obesity. Your cat's food intake will start to rise within 48 hours of neutering and can rise by around 20%, whilst their energy requirements fall by around 30%. Almo Nature Sterilised Salmon and Rice has a low fat content to help to ensure your cat maintains a healthy weight after sterilisation. Urinary stones are more commonplace in sterilised cats, particularly if they are overweight. Cats that have been sterilised usually drink leΒ, and hence produce leΒ urine. Almo Nature Sterilised Salmon and Rice kibble has a controlled mineral content, which helps to lower the pH value of the cat's urine. This helps to contribute to better urinary tract health. 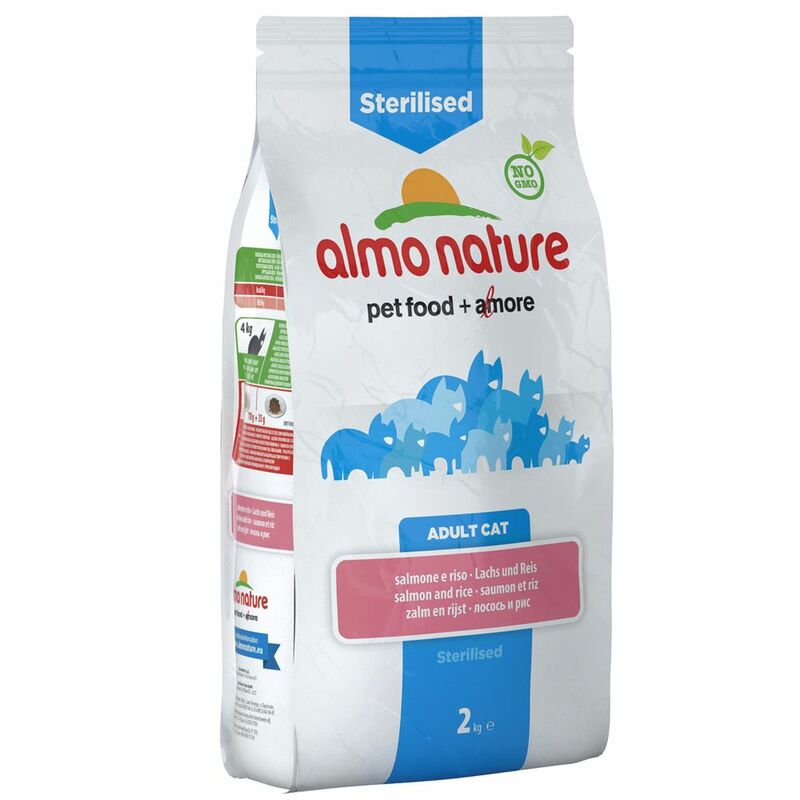 Almo Nature Sterilised Salmon and Rice at a glance: A complete, dry food for sterilised adult cats Ideal for weight maintenance: low fat content helps to keep your cat at healthy weight Premium fish content: 16. 8% fresh salmon, which is easy to digest and rich in natural omega-3 and 6 fatty acids With MOS and FOS: integral in supporting healthy intestinal flora With yucca schidigera: reduces stool odour and wind With linseed: stimulates healthy digestion With taurine: support healthy eyesight, brain function and the nervous system With biotin: promotes healthy skin and shiny fur Optimised mineral content: supports a healthy urinary system Fortified with eΒential vitamins and minerals No chemical additives, preservatives or colourings GMO free.